I returned to the country where I left shortly after I was born, yet everything felt foreign to me. 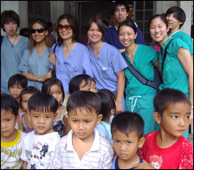 Prior to my departure for the medical mission trip in October 2007, I read books about traveling, living, and seeing Vietnam, but nothing could have prepared me for this amazing experience. Through an organization based in California, Project Vietnam, I had the wonderful opportunity of visiting my home country with the purpose of serving children and women in underprivileged rural villages. Our team of 70 medical volunteers consisted of a diverse group people including recent college graduates, nurses, medical students, residents, doctors, business administrators, and even family members of those who just wanted to lend a hand. Upon our arrival in Ho Chi Minh City (Saigon), we were divided into 3 teams, each with a mission to either provide primary care in villages, train/educate doctors and staff members at local hospital, or perform surgery at a few local provincial hospitals. As part of the primary care team and the surgery team, I was fortunately able to travel extensively in Vietnam. Our primary care team consisted of 7 doctors/residents and about 10-15 other volunteers. We saw patients from sunrise to sundown, averaging about 300-400 patients per day at local villages. Although most patients had chronic problems such as back pain, headache, hypertension, and diabetes, everyone seemed to be thankful for the acute medical services that we provided. Because we also had the blessing of having access to local hospitals, we were able to refer our sicker patients to the hospital through government funding. It was extremely rewarding to see patients leave with smiles on their faces, most of whom have not visited a medical professional in years. Every patient left our clinic with vitamins, local analgesics, and other medications that we provided for their illnesses. Through the surgery team, I had the valuable opportunity to assist in the operating rooms at the local hospitals in Hanoi. As an eager future ophthalmologist, I was ecstatic to learn that I would assist in cataract surgery using phako (which is a novel technique in Vietnam), and pediatric strabismus surgery. It was wonderful to see how quickly and enthusiastically the surgical residents in Vietnam adapted to the new techniques. We also introduced them to the performance of laproscopic cholecystectomy, which was also new to them. Regardless of how much we brought to Vietnam, I felt that I gained the most out of this trip: the memories of this beautiful country, the quiet and modest people there, the warm cultures that my family has instilled in me, and most of all, my newfound friends from this trip. I would really like to express my gratitude to Atlantic Health and the Benjamin H. Josephson Fund for making this trip possible. I would also like to express my sincere thanks to Dr. Kieu and Project Vietnam for allowing me to participate in this mission.